Travel is a drug, there’s no doubt about it. Once you test it out, whether it be from a close friend, a trusted parent, or just peer pressure from a bank that convinced you to travel with their credit card, it’s easy to get addicted. Don’t feel bad admitting it. It happens, I know first hand. The problem with this specific drug, is that no one mentions the side effects. It’s commonly touted as glamorous, exciting, and once-in-a-lifetime, but what always seems to be missing from your so-called “trusted” bloggers, friends, and family is the small, virtually unreadable text found under every drug – otherwise known as a warning label. Fortunately, you have me to set the record straight and warn you of the dangers often caused by traveling… especially for free. Traveling on points may cause you to lose sight of money valuations. Traveling may cause you to want need a bidet. We’re looking at you Japan, Europe, and Australia! Do you three really think you can just tease US travelers with warm butts, weird flushing sounds, and oddly enjoyable water streams and not expect them to feel a yearning for a bidet when they get home? Traveling may make you sound stuck up. Traveling in business or first class, may cause you to never travel in coach again. As the saying goes, “Once you fly in front, you’re no longer a grunt.” err, maybe it was, “Once you fly in front, you’re now a huge cu–.” Who knows. All that matters is that once you sit in a quality business or first class product, it’s a tough transition back into coach. Traveling may cause you to start planning your next vacation while still on vacation. Traveling may cause you to spend more money than you originally planned on. 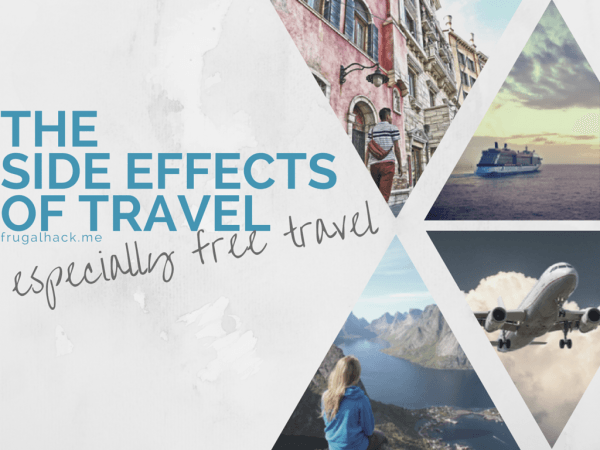 If you know of any side effect travel can cause that isn’t listed above, please contact us below, so we can update the masses! I am not a doctor, lawyer, drug manufacturer, travel agent, stripper, fireman, car maker, gas station pump attendant, or cashier and I definitely do not play one on TV. None of these warnings are guaranteed side effects of taking the drug known as “traveling.” They are just possible side effects that have been known to appear in travelers. Be safe out there folks!